An advanced notification system on daily air quality is developed for the National Capital Region (NCR) of Delhi, under the "Clean Air for Delhi 2010 and Beyond" program. The program is being developed with technical collaboration between two French firms - Aria Technologies SA and Leosphere SA, and the Central Pollution Control Board (CPCB) in Delhi, India, with financial support from the Government of France. The system is now operational and delivering valuable information in support of the Commonwealth Games in October, 2010. The Aria Technologies SA have previously developed similar system for Beijing, which became operational during the Olympic games in 2008 and are also developing one for Rio de Janeiro (Brazil) as part of the Olympics 2016 preparations. Similar to the daily weather forecasts from the Indian Meteorological Department, for the whole country, the program is designed to provide air quality forecasts for at least 48 hours for NCR. 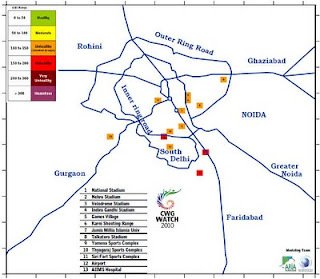 The program has a geographical resolution of ONE kilometer, covering all of NCR (52 km north to south and 52 km east to west), which means that a forecast is available for every nook and corner of NCR, including the transport, residential, and industrial hot spots, and points of interest, such as venues during the Commonwealth games (figure below). While the system is based on a modeling exercise, combining the atmospheric physics of weather forecasting and atmospheric chemistry among pollutants, the inputs include emission intensities from multiple sources contributing to the growing air pollution problem in Delhi. Most common sources observed are vehicle exhaust and road dust, industrial emissions, residential fuel use, generator sets and garbage burning. A number of surveys were conducted to collect information on these sources and compiled to make an informed forecast of air quality. See animations of individual pollutants here. The data also includes information from the existing monitoring network operated by CPCB and laser based LIDAR network deployed in the region to establish horizontal and vertical profiles of aerosols, aka, particulate matter (PM), the most harmful of the pollutants to human health. Starting from September 1st, four stationary LIDARs will be operating in Delhi at CPCB and National Physical Laboratories, and one mobile LIDAR operating during the Commonwealth Games, will be connected to the modeling system in real time. The PM pollution, along with other pollutants, is routinely monitored and the daily averages for RSPM (respirable suspended particulate matter) in Delhi range between 150 to 200 micro-gm/m3, while the daily ambient standard prescribed is 100 micro-gm/m3, over which the incidence rates of health impacts likes asthma, acute chronic bronchitis, eye irritations, and even premature death is higher. This forecasting program is designed to provide pollution alerts to the public and the media and hopefully minimize the instances of higher health impacts in the future for better health. As part of the outputs, the air quality index (AQI) ranging between 0 and 500, is also estimated for various parts of the city and published as a common denominator for multiple pollutants. The system is also utilized for air pollution management by studying scenarios to control pollution and evaluate the impacts of implementation of projects on air quality. Click on the scale for an analysis report for Delhi. Now, the short term goal for the program is to support the Commonwealth Games, by relaying information on air quality, at least 48 hours in advance to the public, the athletes, and the media. The program is expected to continue its operations beyond 2010 under the leadership of CPCB in Delhi and replicated in other cities. Here come the "number crunchers"